Scientists from the German Cancer Research Centre (DKFZ) and the Heidelberg Institute for Stem Cell Technology and Experimental Medicine (HI-STEM gGmbH) have identified a central switch protein in breast cancer that promotes tumor metastasis in response to cellular stress. The switch triggers a stem cell program in the cancer cells that promotes the aggressive spread of the tumor. Chemotherapeutics also activate the switch, and this undermines therapeutic efficacy. By identifying the molecular players involved in the stress-induced spread of breast cancer, the researchers have identified previously unknown possible target structures that could be useful for the development of future therapies. 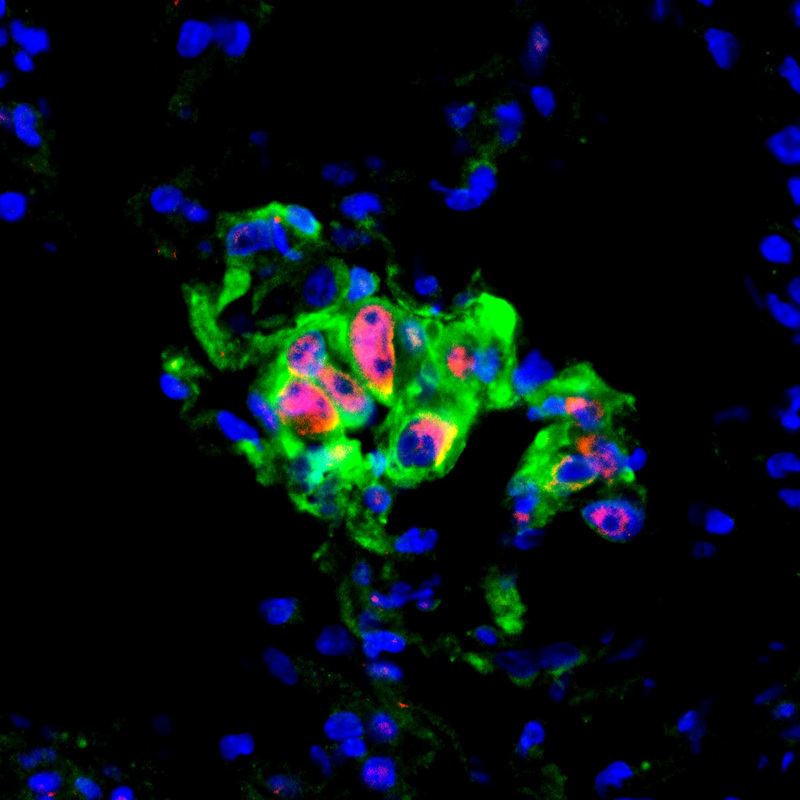 Early lung metastasis in a mouse: Red: active JNK signaling cells; green: cancer cells; blue: cell nuclei. Cancer cells have to deal with many adversities: Their rapid cell division leads to defective proteins in the long run. Their nutritional situation and oxygen supply are often precarious, the toxins of chemotherapy threatening: Scientists speak of "cellular stress" in such a situation. The various stress stimuli activate the enzyme JNK as the central stress switch in the cell. In cancer cells, JNK activation can have a variety of effects; depending on the environment, it triggers a cellular suicide program or a survival program. "We wanted to explore what happens in breast cancer cells after activation of JNK," said Thordur Oskarsson from DKFZ and HI-STEM*. During this study, he and his team discovered a direct connection between JNK activation and the development of metastases. The researchers also found that standard chemotherapy given in breast cancer can also activate JNK, thus limiting the therapeutic response. "The drugs certainly do their job and kill cancer cells, but they can also have parallel effects that we should consider," explains Oskarsson. However, the stem cell specialist points out that his new results open up new opportunities: "We have identified three previously unknown molecular protagonists that are responsible for the metastatic spread and resistance mechanism. These are vulnerabilities in the cancer cells that may come useful when developing future treatment options." Oskarsson and his team initially examined tissue samples from patients with metastatic breast cancer. The more JNK activity the cancer tissue showed, the more unfavorable was the course of the individual disease. Metastases contained more JNK-active cells than the primary tumor. This was also confirmed in mice in which human breast cancer cells had grown into metastasizing tumors. The researchers found particularly striking differences between the tiny micro-metastases, which contained up to 50 percent JNK-active cells, and advanced metastases, where JNK is only active in about 15 percent of the cells. "JNK promotes mobility and invasiveness, which is a typical behavior of aggressive cancer cells. JNK is required for the colonization of new tissue and is shut down again as the metastasis grows and establishes itself," explains Jacob Insua-Rodríguez, a member of the Oskarsson lab and the first authors of the publication. Insua-Rodríguez was interested in what happens in breast cancer cells at the molecular level when JNK becomes active. It seems that they switch to a stem cell-like program because the pattern of their gene activity is similar to that known from breast stem cells. This program is also associated with the production of certain proteins, particularly SPP1 and TNC. What happens when breast cancer cells are exposed to chemotherapy, a stress factor that cancer cells are often exposed to? Oskarsson and colleagues studied this again in mice to which they had transferred human breast cancer cells. The drugs paclitaxel or doxorubicin activated the JNK in the breast cancer cells and triggered the stem cell program. In the lung metastases of the animals, the proportion of JNK-active cells increased drastically from 20 percent to 80 percent. But when the scientists administered the cancer drugs in combination with a JNK inhibitor, significantly fewer metastases formed in the lungs of the animals. However, the proteins SPP1 and TNC, which are formed in response to JNK activation, turned out to be the actual perpetrators of the aggressive behavior of breast cancer. If the mice received breast cancer cells in which SPP1 or TNC were genetically switched off, the JNK activity remains without negative consequences: If these animals were treated with chemotherapy, both tumor growth and the number of lung metastases were significantly lower than in mice to which normal breast cancer cells had been transferred. "SPP1 and TNC are components of the extracellular matrix, i.e. the microenvironment of the cells. Our results are a further proof of how the niche influences the behavior of cancer cells," says Oskarsson and summarizes: "We have shown that we can block JNK activity as the central switch for the aggressiveness of breast cancer cells with specific inhibitors and thus reduce metastasis in mice. And with SPP1 and TNC, we have identified additional two molecular protagonists that are responsible for the aggressive behavior of JNK-active cells. This means that by targeting JNK with a selective inhibitor, we can simultaneously block the production of SPP1 and TNC by cancer cells. The findings help us understand the underlying mechanism of metastasis and therapy resistance in breast cancer." Picture Caption: Early lung metastasis in a mouse: Red: active JNK signaling cells; green: cancer cells; blue: cell nuclei. Use is free of charge. The German Cancer Research Center (Deutsches Krebsforschungszentrum, DKFZ) permits one-time use in the context of reporting about the topic covered in the press release. Images have to be cited as follows: "Source: Tsunaki Hongu/DKFZ".